If you're looking for a way to beat the mid-winter cabin-fever blues, the folks at Treefort Music Fest have just the thing. The three-year-old festival has released the final list of musical acts set to play in Boise March 20-23. It's a doozy: in total, 352 groups will show off their talents to music fans at venues around downtown Boise. Most of the bands announced Thursday don't have mainstream name recognition, regional and local acts continue to be an emphasis. A few notable additions include indie pop band Rubblebucket, surf rockers La Luz and returning hip-hop duo THEESatisfaction. Festival director Eric Gilbert says Treefort headquarters is buzzing with a month to go, but he says things are coming together. "The lineup's really meaty -- we have a lot of acts from all different genres," says Gilbert. "But we're not trying to be Coachella with names like Outkast and Arcade Fire. When it comes to talent, our approach is not so much about buying names as it is about buying good live shows." That doesn't stop other people from comparing Treefort to bigger-name festivals. Just this week, a national travel blog ranked the event right alongside Coachella and Austin's SXSW. Gilbert admits it's great to get that recognition. "We're trying to be really self-aware, and just keep the focus on creating a well-programmed festival based on discovery of emerging bands. We're trying to sell the broader experience." So far, it's working. Gilbert says ticket sales are doing better than they were at this time last year. But time will tell whether the festival can begin paying for itself in ticket sales alone. Here's a handy playlist for those of you considering climbing into the Treefort. Organizers of Treefort Music Fest are considering this their biggest band announcement yet. 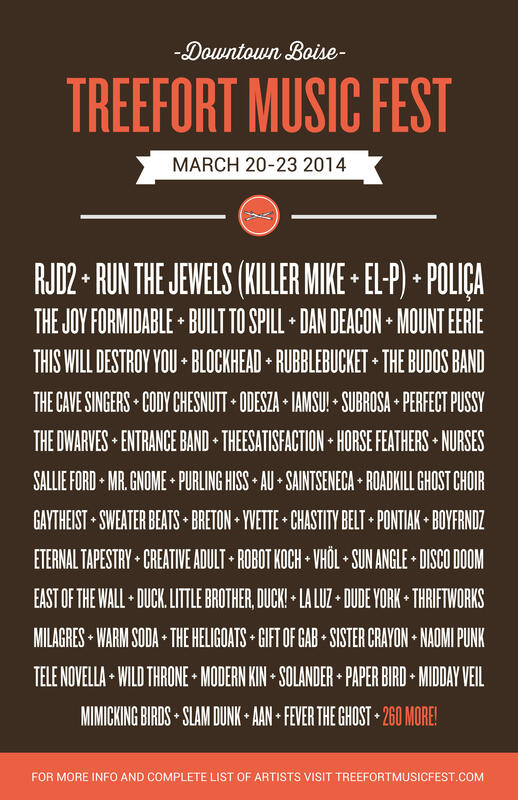 Indie darlings Polica top the billing for the 2014 festival, along with instrumental hip hop acts RJD2 and Blockhead. The festival is March 20-23 in downtown Boise. Boise's Treefort Music Fest released a list of 23 bands that will play at the third annual event next year. Organizers expect that number to grow to about 300 bands by the time the March festival rolls around. Organizers of Boise’s Treefort Music Fest released the names of more bands today. Sharon Jones and the Dap Kings and Animal Collective are the first headliners to be announced for the March 21-24 event. Festival planners are introducing the bands using quirky online videos. Boise filmmaker Zach Voss may be best known for his promotional videos for Boise's Treefort Music Festival. His 2013 Treefort work grabbed the attention of a northwest movie producer, and now Voss is preparing to make his feature-film directorial debut. Boise's dance world was rocked Monday. After six years in Boise, the nationally-acclaimed Trey McIntyre Project (TMP) will disband it's full-time dance troupe in July.